For accurate hair readings, the hair sampling procedure is important. Please read and follow these directions exactly. Important! Do not contaminate the hair with Epsom salt baths prior to cutting a hair sample. Epsom salts contain magnesium sulfate and submerging the hair prior in an Epsom salt bath will inflate the magnesium falsely in the hair test results. Avoid any Epsom salt baths for 1 week prior to cutting a hair sample. Before sampling hair you must shampoo it twice with either unsoftened tap water or preferably reverse osmosis water from the supermarket. After washing your hair, let it dry. Then wait at least 4 hours to cut the sample but no longer than 24 hours. Use a plain, simple shampoo. Avoid Selsun Blue Shampoo. This contains a toxic form of selenium. A better dandruff shampoo, if needed, is Head N’ Shoulders. Do not add conditioner and definitely do not place any other products on the hair after washing it on the day you will take the sample. Do not send dirty, sweaty or greasy hair as your sample. Keep track of which end of the cut hair is from the scalp. We only want the inch or so of hair that was directly against your scalp. The hair furthest from the scalp is the oldest. Older (longer) hair will show the chemistry of your body months or even years ago, so it is not accurate for your body’s current chemistry. Cut and discard the unwanted ends of the hair until all you have is the 1.5 inches or so (or about 3 centimeters) or less that was closest to the scalp. Use a ruler to be sure you have the right length of hair. It does not matter where on the head you cut it. If you cannot use head hair, the second best choice for men is beard hair. You can also use pubic hair, although it is not quite as accurate. Avoid combining hair from different parts of the body in one hair envelope. Once you have cut the hair sample, set then down. 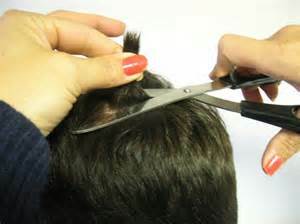 Cut off any hair that is more than about 1 inch, or about 2 centimeters long. Shorter hair is excellent, and the shorter the better, in fact. Do not send in hair that is cut from the ends of long hair. Cut the sample from close to the scalp. If you do not have one, place it in a clean, paper envelope. Do not send hair in aluminum foil. The lab will require 125 mg of hair. If you have the paper scale provided from the lab, it must tip for you to have enough. If you do not have the paper scale provided, then completely fill a tablespoon with hair. Write legibly and put the age on the small hair sampling envelope. If the person is a child, include their body weight. If hair will be sampled by your hair stylist, make sure to print out and give the stylist these instructions. Many stylists cut the ends of the hair, which is incorrect and will not give accurate results. If possible, take a hair sample before dying your hair. Tints and dies do not affect the test because they do not contain any minerals so you may sample dyed hair. Ideally do not dye your hair as all, because hair dyes contain some chemicals. These treatments alter the structure of the hair somewhat. Sample the hair before a treatment or wash the hair 10 times after a bleach or permanent treatment before sampling the hair. Dyed hair can be used IF it is after 10 washings AND 4 to 6 weeks after the hair is dyed. If you shave your head, then cut with an electric razor what you can and save it in a paper envelope. Then razor cut it again in a week or so. Repeat a few times until you fill a tablespoon with hair or when you have enough to tip the scale if you have a paper scale to weigh hair. If you are bald, then cut with an electric razor what you can and save it in a paper envelope. Shave it again until you fill a tablespoon with hair or when you have enough to tip the scale if you have a paper scale to weigh hair. Pubic hair in adults can be used. Pubic hair grows at a slower rate so the results are usually a little higher in the pubic sample. The first sample is more a baseline report, the recheck is a current reading due to all new pubic hair growth. Cut the pubic hair as close to the skin as possible for the sample and send in the same amount as you would for a hair sample. Pubic hair will show a higher level of phosphorus than head hair. Note: your lab form and supplies are provided by us.